Adrenaline-packed motorcycle for wheelchair users and disabled motorcycle riders, manufactured in Columbus, OH. The Trident™ wheelchair motorcycle is designed to accommodate any type of wheelchair, including electric wheelchairs, as well as those with other disabilities, utilizing a bucket seat configuration. 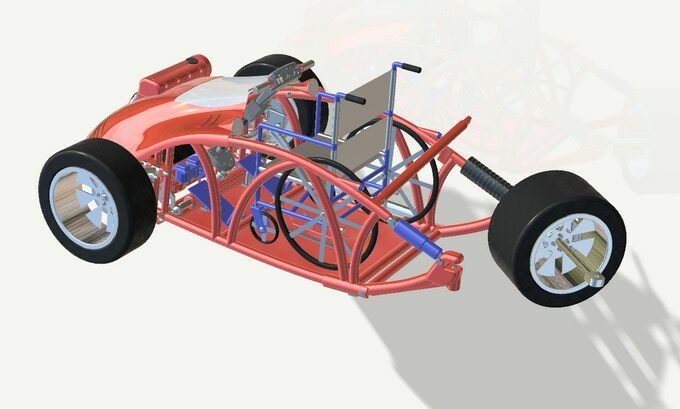 We are raising funds to build the first model, which will be donated to Colin, a handicapped father, who lost both of his legs in a motorcycle accident more than 10 years ago. Frame Design - The frame design tightly constrains the wheelchair, it is rigid by both material and shape, which helps protect the rider. 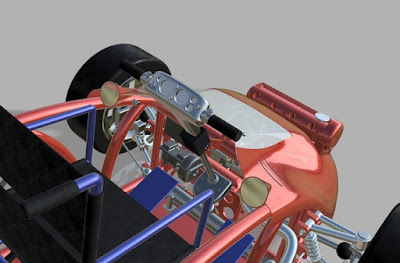 Multiple retaining points are used to hold the wheelchair and rider, which creates failsafe redundancy. 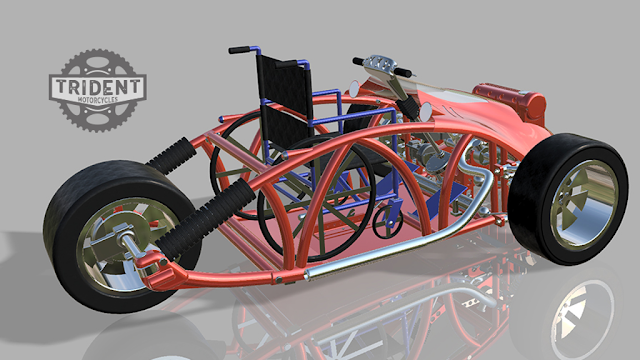 Each motorcycle can be customized to best fit the rider and their wheelchair and the licensing of the motorcycle is as a 3-wheel trike. Eco Friendly -The Trident™ wheelchair motorcycle is an eco-friendly design, that can run on regular gas, alcohol, CNG (Compressed Natural Gas), or hydrogen; making it a low or no pollution motorcycle. On March 31st (Easter Sunday) I took my 13 year-old daughter for a ride on the back of my motorcycle. My life changed forever as we encountered a car making a U-turn in the center of the road. Due to the road conditions, I knew a crash was unavoidable. Prior to impact, I yelled for Kelsie to bear hug me and hang on. I was going to keep her safe, by the grace of God. We went from 70MPH to 0MPH in about 10 feet, and were both thrown from the motorcycle.The first words I heard when I came to was Kelsie telling me she was ok. I immediately went into surgery and for 11 days, fought for my health while the doctors did their job. 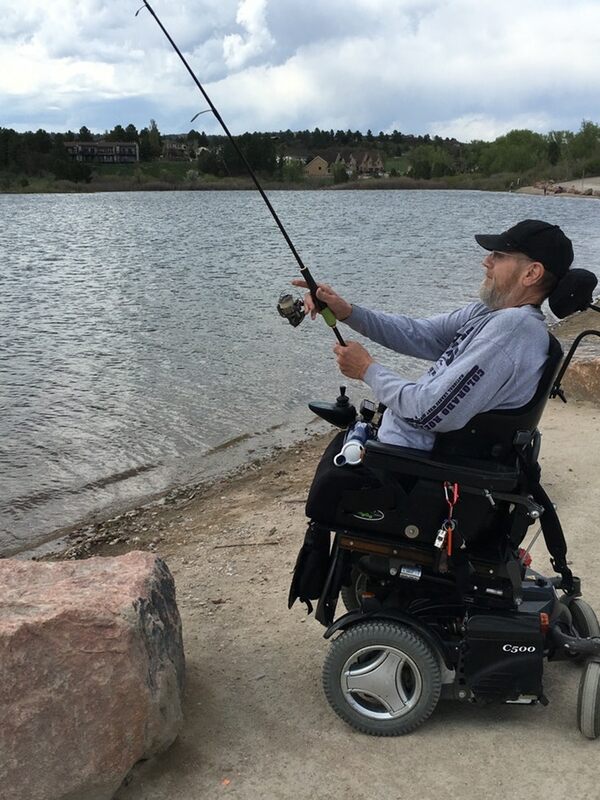 On the 11th day, the doctors brought me out of an induced coma to state they needed permission to amputate my legs, and announce to me that I was now paralyzed from the chest down. I became a member of the 1% club of people to survive this type of accident. It was truly a miracle. It’s been over 14 years since the accident and I have since said goodbye to the days of riding my motorcycle, until my good friend Nate reached out to me and told me it would be possible for me to ride again with a prototype motorcycle concept he had been designing for several years. The design is now complete and ready for production. It would be a dream of mine to once again ride a motorcycle, as well as open the roads for others like me who have suffered disabilities. To do this, we need your help! We are on KickStarter to raise funds in order to build the first motorcycle. Once our first bike has been built, we will begin production so that others can ride again. Your contribution will help cover the cost of building the very first Trident Motorcycle and help my dream of riding again become possible. Thank you for your support and love. I look forward to seeing you on the road! A pliable design approach, working with the client to develop attractive, highly marketable, cost-effective, product/project solutions. 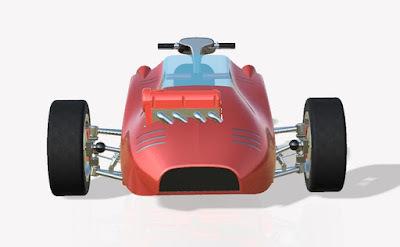 • Independent research to find the best fit in technology, materials and production. The Trident Motorcycle Team A unique group of people, committed to the design and manufacturing of transformative mobility devices. To mitigate over-budget production costs, the first Trident Motorcycle will be manufactured with parts that have been remanufactured and ready for production, this aligns with our commitment towards earth stewardship and eco-friendly manufacturing processes with sustainable environmental impact. Questions about this project? Submit a Question here. Pledges are available from $15 all the way up to $2500 or more. To Pledge and support this Kickstarter, check it out here.